When I was in college, I would get so excited on the days when corn chowder would show up in the dining halls. The black bean soup was pretty fantastic too, but the corn chowder was the undisputed champion. Years later, when I decided I had finally better stop eating hummus and pita for dinner and learn how to cook, my mind wandered in a corn chowder sort of direction. But it seemed totally unmanageable to me. This seems laughable to me now, but it isn’t really too many years behind me in the rearview mirror. Five years ago, I didn’t know how to cook anything at all besides lasagna. Yogurt seemed like a reasonable lunch, with pears and peanuts as a chaser. On nights when I felt up to facing the kitchen, I made quesadillas and grilled whatever vegetables I found in the bargain bin at Berkeley Bowl (those were two separate dinners, lest you think I was too creative). But after my PhD exams, I decided that something had to give. I learned to bake bread and make curry. I discovered quinoa and fennel. I made black beans with red rice, and I started simmering spicy split pea soups. I was on my way. 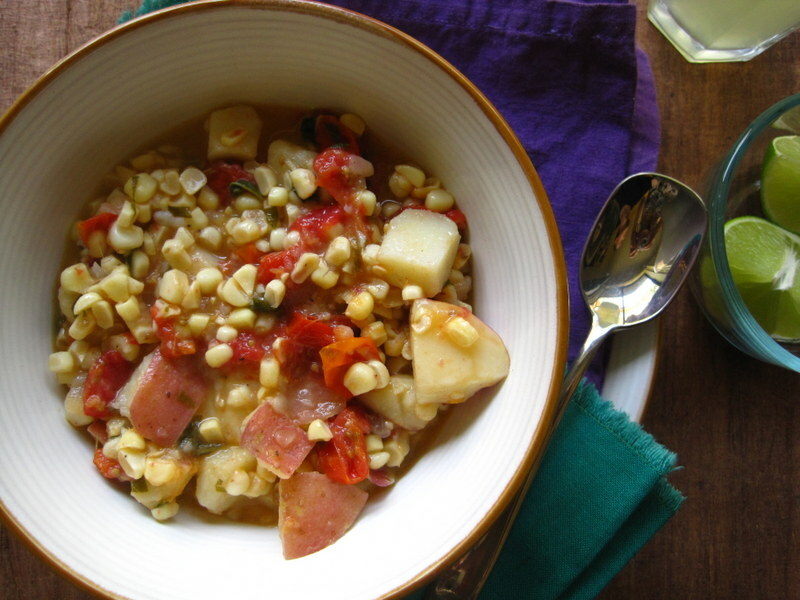 Corn chowder didn’t re-enter my mind until I saw this recipe in a magazine, and I was ecstatic to feel like I could tackle it. 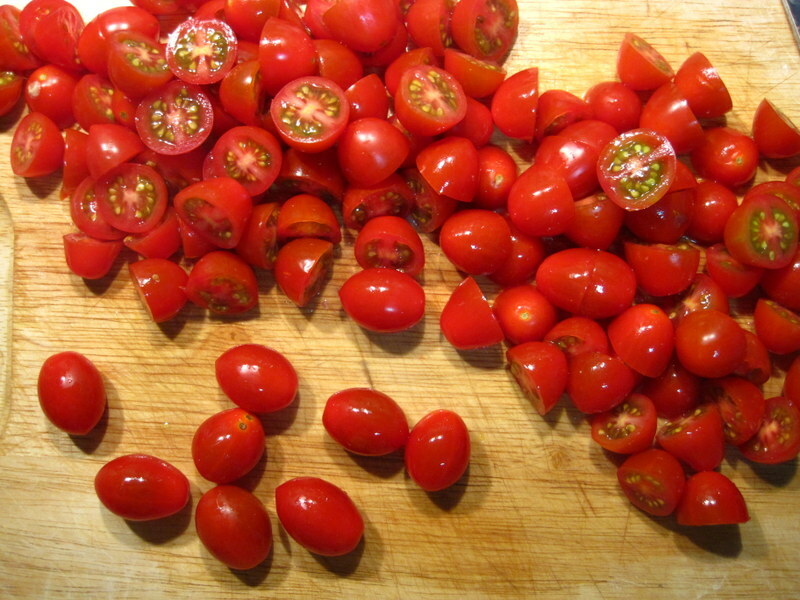 Slicing an entire pint of cherry tomatoes and tossing them in just adds to the summer celebration in your kitchen. I so look forward to this soup every winter, right about when I think I never want to see another butternut squash again. Thank heaven for seasons! A hearty squeeze of lime and a few good handfuls of fresh basil take this soup from delectable to divine. Even if it seems odd to eat hot soup during the summer, crank up your AC extra high to make up for it. It’s worth it. 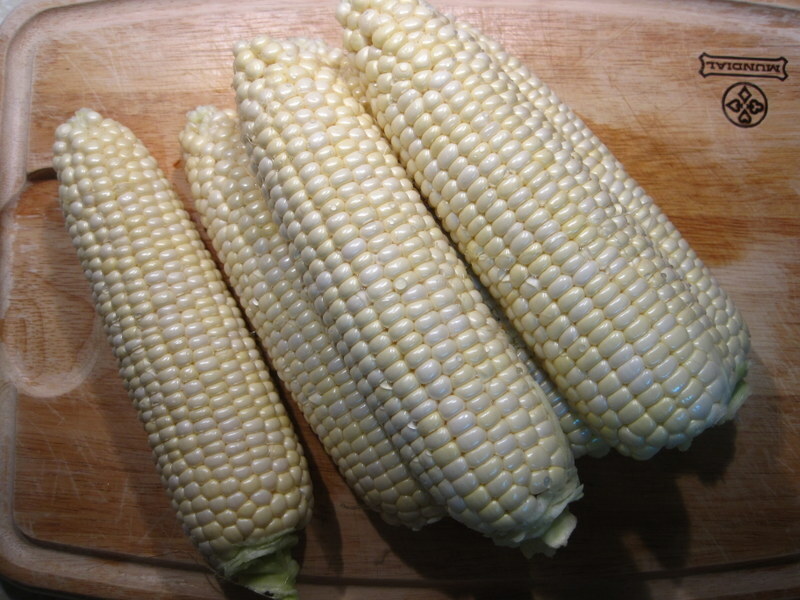 -Slice corn kernels off cob and place in a bowl. Run back of a knife along each cob to remove additional corn pulp. Add pulp to bowl; reserve cobs. -In a medium soup pot or Dutch oven, melt butter over medium heat. Stir in onion, shallot and garlic. Cook, stirring occasionally, until softened, about 5 minutes. -Add broth, reserved cobs, 1 cup water and 1 teaspoon salt to pot. Bring to a boil over high heat. Immediately reduce heat to medium and simmer for 10 minutes. Add potatoes and simmer until potatoes are tender, about 15 minutes longer. Remove cobs and discard. 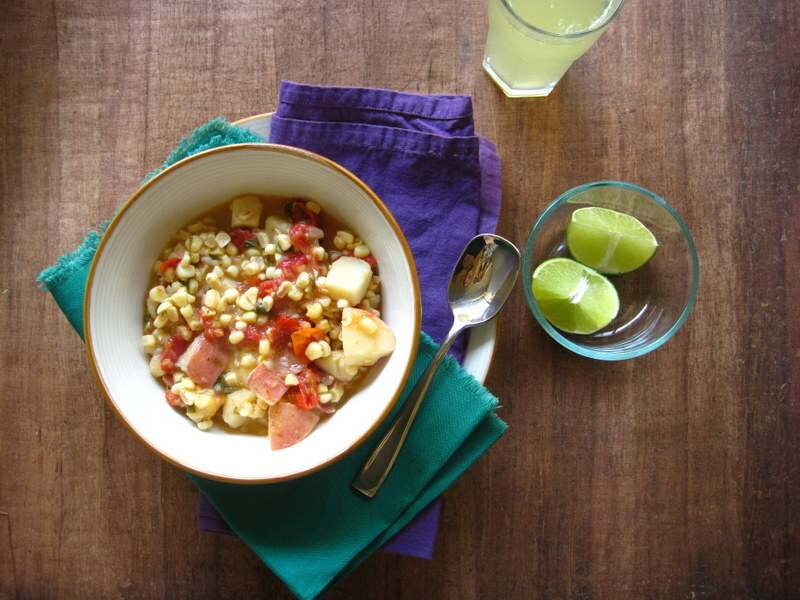 -Stir in corn kernels and pulp, tomatoes, remaining 1/2 teaspoon salt, and pepper. Simmer for 20 minutes more. Stir in the basil and lime juice. Turn off heat and let soup cool for at least 15 minutes before serving. Oh, so yummy. The delicious tastes and smells jump right off the page! It is! It would be even better with yellow corn. A girl can dream! This looks so good! In definitely making this next week! Thank you! Everything you make looks amazing to me too–so many fresh veggies! I just made this! It was sooo good! Oh, I’m so glad! It’s definitely a summer favorite around here! I love watching the seasons change at the farmer’s market, and this is about the time of year when we switch to a corn, tomato, poblano pepper, and berry repertoire. I love it!